Its not “if” it happens, but when. As of march 15 2013 the S&P is now within its historic reversal area, the Dow Jones is broken through its old peak, but with no real pull back to test the lows yet. Our current levels make for a dangerous time to be in the stock market. This reversal area that I’m speaking of has been a bull market killer every time we’ve come in contact with it so far (the dot com bust was the first time we hit this area, and the 2008 crash was the other time.) Can the stock market make it through these levels of resistance? In theory, yes, but I wouldn’t be betting on it. Well, it seems that we have escaped the December 21 2012 day-of-doom, although some are saying that there may have been some miscalculations in the date, and could instead be the 23rd, or 24th of December 2012, so all you dooms-dayers may want to wait past Sunday, or Monday to climb out of your bunkers, and take off your tinfoil hats. Meanwhile, back in the in the real world, the S&P took quite a hit today thanks to Washington’s gridlocked fiscal-cliff negotiations. Above is a picture of where the S&P stands at present. If we go over the cliff, the red circle will probably be left in the dust, as the two circles are short term goals. If we are saved from the doom of the cliff we may make it to the green circle, and beyond it. The bear side of me tells me we will be seeing more red. Maybe the Mayan’s where predicting a stock market doom? The S&P is currently below its 200 day simple moving average. 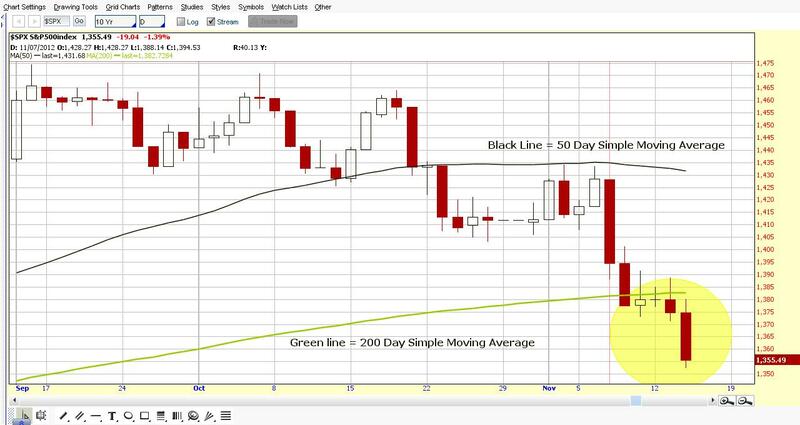 This is bearish in nature, as the 200 day moving average represents a solid floor if the stock is above it, or as a strong ceiling, if below it. Since the recovery that started in 2009 the S&P has remained above the 200 day simple moving average for most of the time. It has dipped below this moving average several times since the recovery, most have been small, brief moments not lasting more them four trading days. We have had some stronger moments below this line, and its is these strong pushes below, similar to what we saw today, that led to prolonged periods of the index consolidating, or going flat. The first time this happened was back in 2010, when the index stayed below the 200 day simple moving average for almost five months. It happened again in August 2011 and did not pull out of this slump in till January 2012. During this last stint the index moved strongly toward the down side, falling over 180 points in just six trading days. Just because this last trading day was a strong move down, does not mean that we are destined to stay below this moving average, but the next few trading days can be important in determining which way the index will go. We may see a move to try and break through this resistance, and if we are successful we may avoid a sharper decline. If we fail to break above this line, we may see a rapid decline that can last for a good few days before finding some temporary footing. 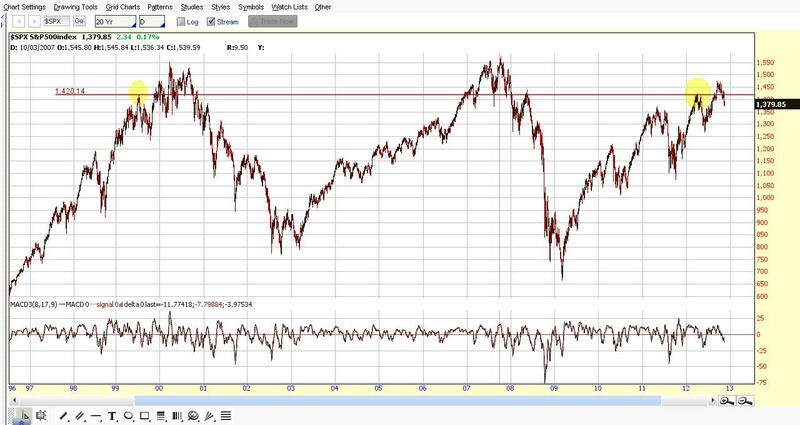 The current peak of the S&P that was made on September 14, 2012 of 1474.51 has a correlation to a previous peak that was made back on January 3, 2000. 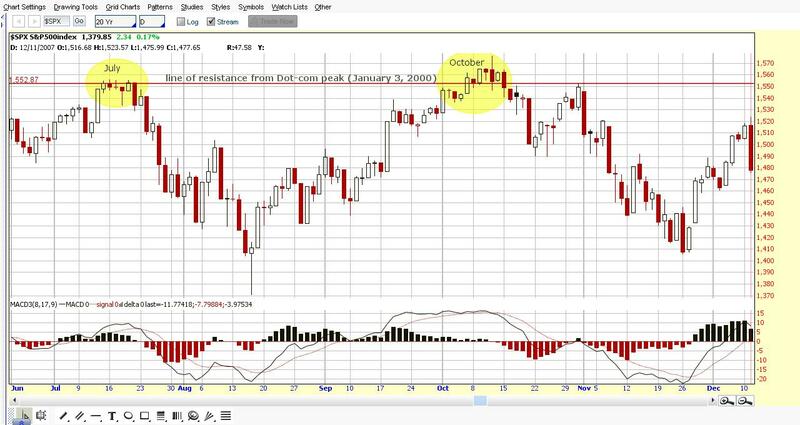 The peak in 2000 was part of the famous bull market that ultimately led to the Dot-com bust.The January 3rd peak was only a temporary high which led to a pullback before reaching the Dot-com’s peak of 1552.87 a few weeks later on January 24, 2000. At this point the index pulled back from its high, and on September 1, 2000 a reversal had begun that would eventually take the S&P to 768.63–a decline of 784.24 points. This temporary high that was made back on January 3rd 2000 affected what happened on September 14, 2012 in the S&P as was evidenced when the index pulled back from this price line that represented a level of resistance for the index. At this point it is going to take a concerted effort to break through this level of resistance if we are to make a higher high then our current one. This correlation does not end with the current high of the S&P. The previous high of 1422.38 made on April 4, 2012 also correlates to the next previous high that took place before the January 3rd high. 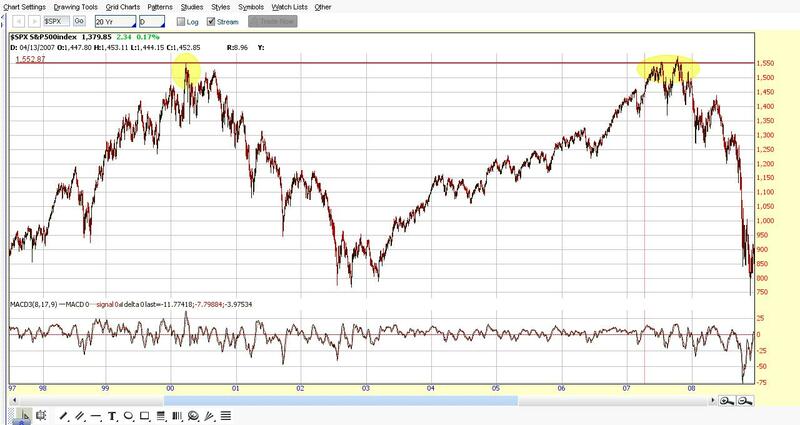 This peak was made on July 19, 1999 with a price level of 1420.14. Back in April of 2012 when the S&P hit this 12 year 8 month-old level of resistance, the index also declined and was unable to successfully break through it until September 6 2012. The previous high of 1422.38 made on April 4, 2012 also correlates to the next previous high that took place before the January 3, 2000 high. 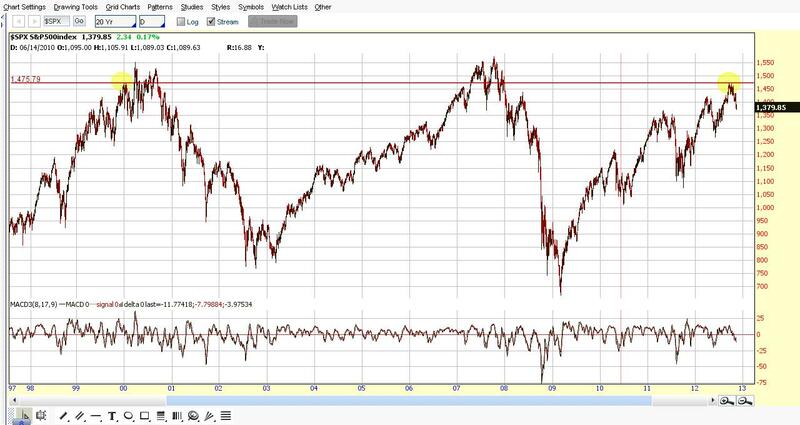 This peak was made on July 19th 1999 served as resistance to April 4, 2012 peak. Where this correlation ends is with the ensuing corrections that followed from these peaks. Each correction that followed has bottomed out in a different place. The ceiling of resistance that was made over 12 years ago on January 20, 2000 continues to haunt the S&P. In 2007, the S&P tried twice to break it: in July and in October. The attempt in July 2007 brought a few intraday trading breakthroughs followed by quick pullbacks. The attempted breakthrough in October was briefly successful, managing to stay above this key level a few days, before retreating and sinking back below this level again. This brief moment of success was also an important turning point for the S&P. At this point the index reversed and started a deep decline that eventually became the crash of 2008. The peak that was made over 12 years ago on January 20, 2000 continues to haunt the S&P as it has been unable to stay above this powerful line of resistance. Attempt made in July 2007 brought a few intraday trading breakthroughs followed by quick pullbacks. Again in October the S&P was briefly successful, managing to stay above this key level a few days, before retreating and sinking back below this level again. We are now close to this ceiling once again. If this correlation between the bull market that led to the Dot-com burst and today continues to hold, the current bull market that we have been experiencing since 2009 may now be in its latter stage. If we are to make a higher high than the current peak made on September 14, we would be entering what historically has been a reversal zone for the S&P. 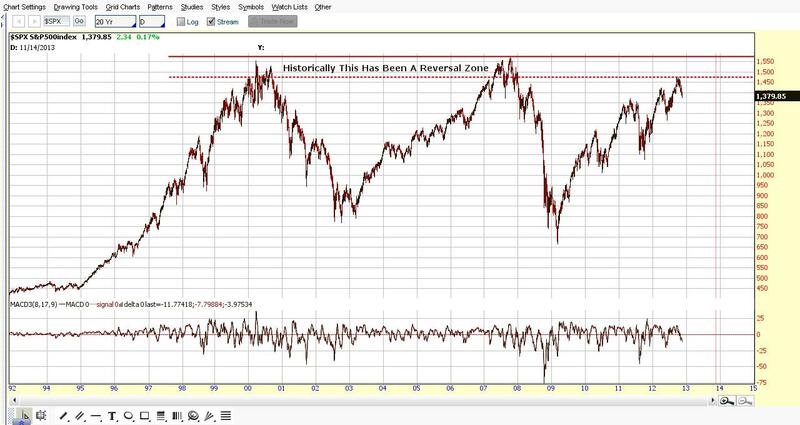 Historically this area has been a reversal zone for the S&P. 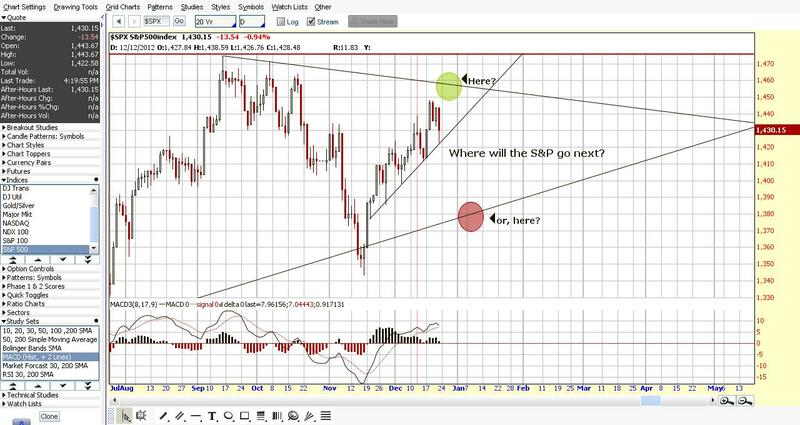 Reversals from this area have brought about large bear markets. Given the current weaknesses in the global economy and the S&P’s historical reaction to this ceiling, we must be prepared for a possible reversal in the coming months ahead. This current pullback that we’ve experienced following the reelection of Obama this past week could be the start of this reversal. It may also just be a temporary pullback before resuming its upward trend again. No one can say for certain what will happen, but we do have the power to be wise in our investments. Are There Logical Reasons to Believe that God Exists? Here is an interesting video on the existence of God by William Lane Craig. Lytro has a new camera that can refocus the picture after the photo has been taken. That’s right after you take the photo you can focus on something in the photo that is out of focus. Here is article about the new Lytro camera.